News on the trade front and the Federal Reserve minutes, due this afternoon (2 p.m. ET), will help decide whether equities can extend their 2019 winning streak. Stocks in Europe and Asia found traction overnight as U.S. equity futures drifted with the market awaiting the release of minutes from the FOMC and ECB this week. The dollar is steady, and the yuan has rallied after a report that America is asking China to keep its currency stable. For the other major currency pairs its business as usual – the is still driven by two weaknesses, bleak economic indicators in the U.S. and dovish remarks from Fed members, while is still trading firmer, with the market convinced that a Brexit withdrawal deal will be reached by March 29. Nevertheless, intraday sterling volatility is expected from today’s discussion between the U.K. and the EU regarding a Brexit deal (02:30 p.m. ET). Elsewhere, gold trades atop of its 10-month highs amid increasing bullishness while West Texas crude oil trades above $56. On tap: FOMC monetary policy minutes (2 p.m. ET) and employment change (7:30 p.m. ET). In Japan, the closed at another nine-week high overnight, as hopes for Sino-U.S. trade talks helped lift cyclical stocks such as autos and index-heavyweights including SoftBank Group. The Nikkei share average ended 0.6% higher, the highest close since Dec. 17, while the broader gained 0.4%. Down-under, Aussie stocks faltered overnight, as gains in resource stocks failed to lift broader market sentiment following a bleak outlook for the consumer and property sectors. The declined 0.2% after rising 0.3% on Tuesday. In South Korea, stocks ended at a four-month high overnight as a weaker dollar boosted appetite for South Korean stocks amongst foreign investors. The benchmark closed up 1.09%, with Samsung Electronics (KS:) leading the gains. In China and Hong Kong, stocks edged higher as Sino-U.S. trade talks seem to be progressing. The settled 0.2% higher, while the blue-chip gained 0.4%. While in Hong Kong at the close of trade, the was up 1%, while the Hang Seng China Enterprises index also ended 1%. In Europe, regional bourses are trading higher across the board following a mostly higher session in Asia overnight and slightly lower U.S. futures. 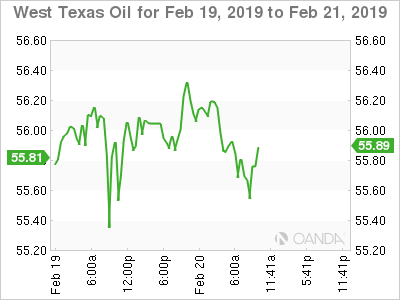 WTI for Feb. 19-21, 2019. Oil prices slipped from this year’s high overnight, with surging U.S. supply and slowing economic growth capping price gains supported from supply cuts led by OPEC+. futures are at $66.41 per barrel, down 4c from yesterday’s close, though still not far off their 2019 high of $66.83 per barrel print on Monday. U.S. West Texas Intermediate (WTI) crude oil futures hit 2019 highs of $56.39 per barrel earlier this morning but has slipped back to $56.16 per barrel. Note: OPEC and Russia agreed late last year to cut output by 1.2 million bpd to prevent a large supply overhang from swelling. Crude ‘bears’ expect OPEC-member and top crude exporter Saudi Arabia to reduce shipments of to Asia next month as part of the effort to tighten markets. Because of the cuts, crude ‘bulls’ expect Brent to average $73 per barrel and WTI to average $66 by year end. Nevertheless, standing against the supply cuts is U.S. crude output, which has soared by more than 2 million bpd in 2018 to a record 11.9 million bpd due to a “booming shale oil production,” which the EIA yesterday announced that it expects to keep rising. Ahead of the U.S. open, gold has rallied to a fresh 10-month high as the ‘big’ dollar struggles ahead of the U.S. Fed’s policy meeting minutes. is up 0.1% at $1,342.46 per ounce after rising to a high of $1,346.73 earlier in the session. U.S. are steady at $1,345.40. Note: Expect investors to look for direction from the Fed’s minutes at 02 p.m. EDT – The ‘dovish’ shift over the year-to-date has improved the fundamental outlook for gold prices. 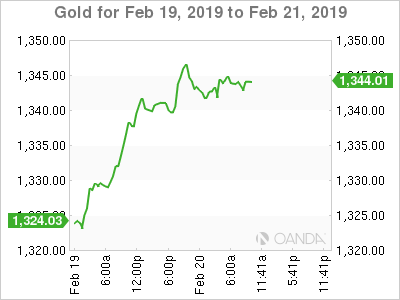 Gold for Feb. 19-21, 2019. Italian government bond yields backed up 5 to 6 bps across the curve yesterday after data this morning showed industrial orders in the euro zone’s third-largest economy dropped 5.3% in December over the same month in 2017. Italy’s 10-year BTP yield was last up 6 bps at 1.74%, pushing the gap over German 10-year Bund yields to 273 bps – 10 bps wider on the week. Elsewhere, the yield on 10-year Treasuries has decreased 1 bps to 2.64%. In Germany, the 10-year Bund yield has dipped 1 bps to 0.10%, atop of the one week low, while in the U.K, the 10-year Gilt yield has dipped 1 bps to 1.164%. 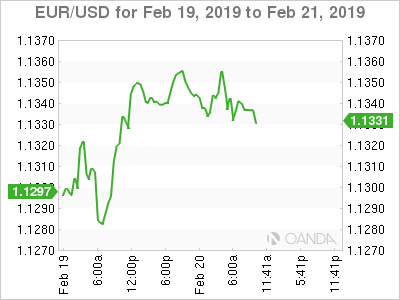 EUR/USD for Feb. 19-21, 2019. EUR/USD (€1.1339) is a tad higher and back within its recent six-month trading range between €1.13-15 area. Data this morning from Germany shoed that January PPI data (+0.4% vs. -0.2%) was a tad stronger month-over-month. GBP/USD (£1.3030) is slightly softer by 0.2% to move off its recent two-week highs. The focus remains on today’s upcoming talks between UK Prime Minister Theresa May and EU Commission President Jean-Claude Juncker. Note: A spokesman for May confirmed that she will be looking for a legally binding concession on the Irish backstop. A vote is due to take place in parliament Feb. 27. Assuming May is unsuccessful today, realistically there are really only two ways forward – either a cross-party compromise or a new referendum. A delay in Brexit is starting to look inevitable. The (¥6.7212) traded at a multi-week low overnight as Sino-U.S. trade talks continue. Trump has expressed flexibility with a March 1 trade-deal deadline. The U.S. is seeking a stable yuan to be part of any agreement. 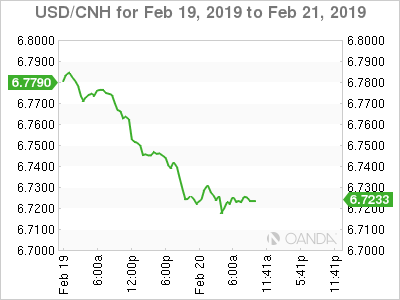 USD/CNH for Feb. 19-21, 2019. German data this morning showed a sharp surge in the German PPI figures. The index of producer prices for industrial products (PPI) rose by 2.6% compared with the corresponding month of 2018. The Federal Statistical Office (Destatis) also reported that the annual rate of change all over had been 2.7 %. Compared with the preceding month December 2018, the overall index increased by 0.4% in January 2019. In January 2019, the price indices of all main industrial groups increased compared with January 2018 – energy prices rallied by +7.2%, compared with a +0.6% print in 2018. 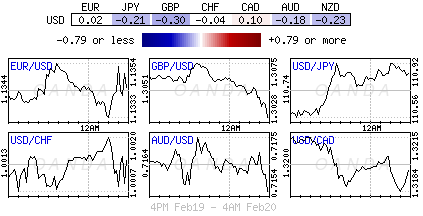 U.S. Dollar Index for Feb. 19-20, 2019.